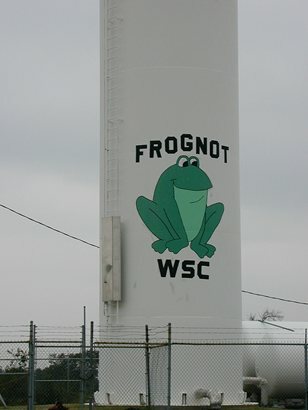 Frog, Texas and Frognot, Texas. Frog, Texas is a former African-American community founded in the last years of the 19th Century. It can be found just south of Highway 80, 7 miles E of Terrell on FM 316. According to the Handbook of Texas, some of the town’s first residents had been employed by the railroad. Founding families included the Stephenses and Starlings and in the 1930 and 40s, these two families populated 28 of the 36 houses that formed the community. Frog (whose namesake is said to be a family surname), had Baptist and Pentecostal churches as well as a school and store. 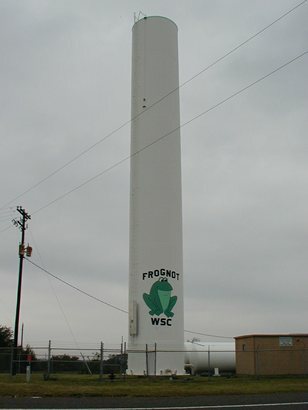 In the 1990s Frog got an infusion of new residents, although the Baptist Church had since relocated to Terrell. The Pentecostal church, still holds services. No photos of Frog, Texas were available as of this writing. 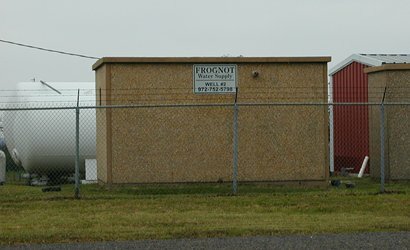 Frognot’s history is not known. Other than the standpipe, there is no town center or any signs of a community. It may be a Municipal Utility District or a water district.